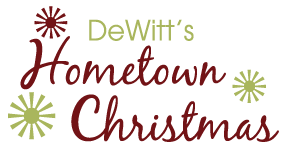 Hometown Christmas is a free event to the public. Come spend the day in DeWitt and get into the Christmas spirit!! 9:00-11:00AM: Santa arrives at the American Legion Post 238 to visit with Children and hear their wish lists, also enjoy carnival games. 9:30-NOON Donuts, make-it and take-it craft tables and carnival prizes (donated by the Noon Lions) at the DeWitt Community Center. Noon Lions will be performing Free KidSight tests. (for safety purposes, children must be escorted to and from the movie if the parent or guardian is not attending). 5:00-7:00PM Live Holiday Windows, Gingerbread House Contest, Warming Stations, Elf on the Shelf Contest, and Caroling in the Downtown area. 5:30PM: Our newest addition is the Lighted Pickup Parade down 6th Ave! For more details or for information on how to be a part of the parade click on the title "Pickup Parade"
Check out last years Hometown Christmas photo album on Facebook!! Join the event page on Facebook here! Thank you Hometown Christmas Mistletoe Sponsors!!! Saturday, December, 5th, all day event! For questions about being a part of the Holiday Parade contact Dianne or click here to see more details!